Just to the left of the structure at 115 West Main was the very similar 109-111 West Main, a Queen Anne structure built in 1893. 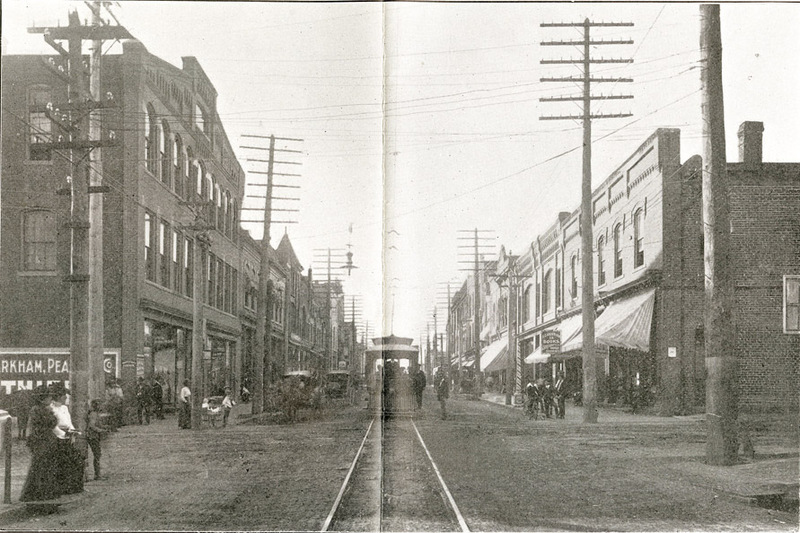 And a view west from Mangum St., 1905, doesn't show much of the building, but the small tower is clearly visible. 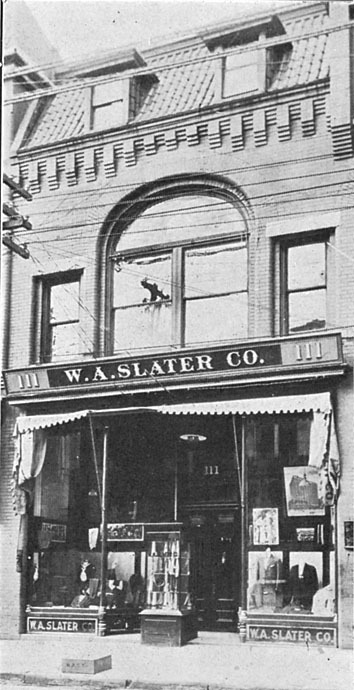 111 West Main had the WA Slater clothing store as an early occupant. 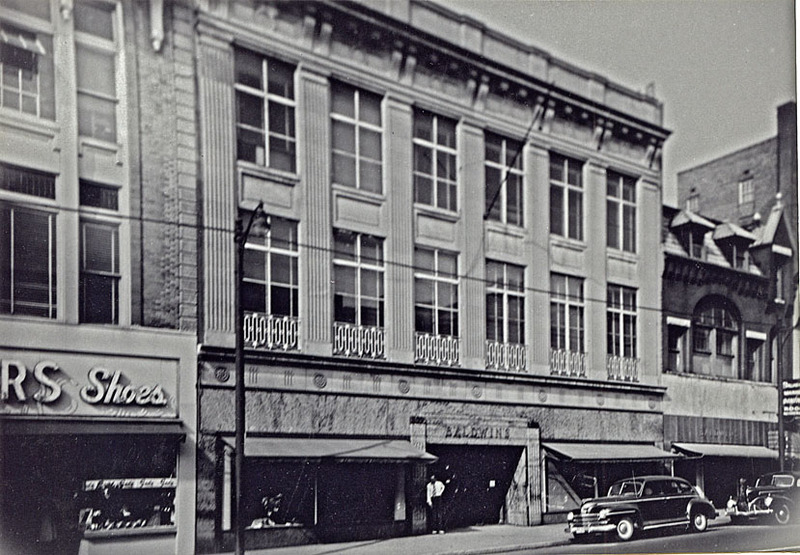 In 1928, Baldwin's Department Store, which started in 1911 in the small two-story brick structure next to 109-111 West Main, constructed a new building of neoclassical design on the same site, 107 West Main. Below, looking southeast from the Washington Duke Hotel. 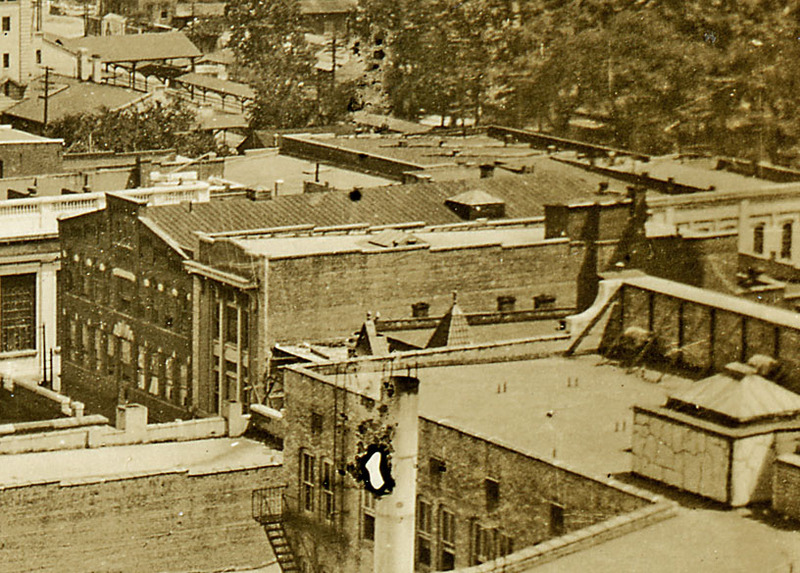 The roof peaks of 109-111 W. Main are just visible beyond the Geer Building. Immediately to its left is the scaffolding of the building under construction. 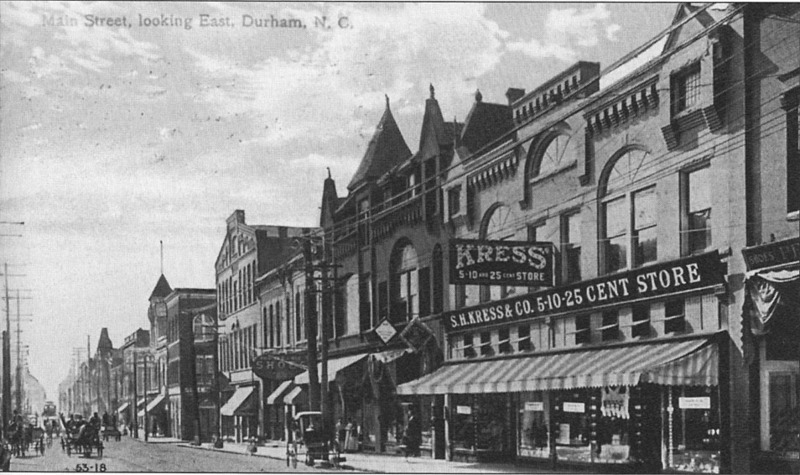 Looking south from Main St. ~1928. In the 1940s, Baldwin's bought 109-111 West Main and demolished the eastern (109) half of the building. They then expanded their building by extending the original design pattern, such that the new building was not noticably built in two stages. The remaining portion of 111 West Main was used as storage by Baldwin's. The picture below is of a 1960s protest in front of 111 West Main. I believe that, in the segregation era, Baldwin's would not admit African-Americans to their store. By the 1970s, both Baldwin's and 111 West Main had received some facade re-do on the first floor, but fortunately, were spared the flat-front, brick-up-the-windows abuse heaped on so many of these properties downtown. Scaffolding going up to apply new facade, 1960s. 111 West Main was renovated as office space in the 1970s and remained occupied. When Baldwin's moved west in 1986, the original building was, I believe, left vacant. And so it stayed for quite a long time. It's hard to believe how much things have changed downtown in a relatively short period of time. When Catherine Gutman and her parents bought the Baldwin building in 1999 with the intent of renovating it into apartments, the mere thought of someone willingly buying a downtown, in-the-loop building for wholesale renovation was astounding. And so it seemed that it was just a pipe dream, as that deal fell though in ~2002. But then the building was bought by Mike Lemanski, aka Greenfire, in 2003 as his first property renovation in downtown, which was completed in 2005.